Looking for ways to somehow get rid of your old rusted car without paying any towing fee? Want to earn some cash in the process? Also interested in freeing up some valuable space in your driveway or yard? Then you’ve reached the right place. 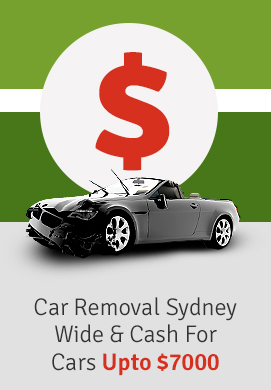 Our team at Cash For Cars pays HIGHEST POSSIBLE PRICE up to $7000 and guarantees same day speedy removal in Sydney. We pay cash at door for old car removal and can buy old cars, trucks, SUV’s, Jeeps, 4WD’s, bikes, and even boats. Therefore, if you live anywhere in Sydney and are wondering whether you can sell your old car and avoid all nasty hassles of private sales, you’re already here! The biggest reason to choose us for old car removal is that we purchase almost all types of cars, damaged or new, junk or registered, trucks, bikes, vans, and even SUV’s. Our team offers you the highest ever price in Sydney and will pay you the entire promised amount at your door. When you choose us for old car removal, the process of selling your scrap car becomes as easy as 1, 2, 3. You just have to pick up your phone and call us. Provide us important details of your car and soon we’ll revert with a completely FREE quote. Once you agree to our quote, we will quickly dispatch a team of drivers along with a tow truck to your place. We will also complete the entire paperwork for free and will also inform you of the exact procedure to hand over your license plates. Isn’t that awesome! We’re the most professional, oldest, and most reputable old car removal company of Sydney and have been actively serving the community for many years. We promptly pay up to $7000 cash for your old rusted vehicles. We are really fast and can reach your place within hours or at the time most convenient to you. We’re open 24 hours a day, 365 days a week. We can even come on weekends for old car removal. The process to get a FREE quote is very easy. You just need to call us on phone, or fill up a short form on our website. Soon our friendly representative will get back to you with an indicative price. You can contact us at your convenience to confirm or discuss your valuation. You can also finalize the sale by simply calling us, or by sending a short email to arrange a no-obligation onsite inspection. This just takes minutes and once it is complete our team will take care of all paperwork. We will pay you the promised cash right at your door before you hand over the keys of your old car! Old unwanted cars can be a big headache as it’s very difficult to find buyers. You also cannot dump them anywhere as you may have to pay hundreds of dollars as towing charges to the nearest junk yard. Sometimes the car has absolutely no selling value. We will always pay you the HIGHEST POSSIBLE price up to $7000 and tow away your old, rusted car for free. So whether you’re worried about your old car removal, or it is a truck, van, SUV, 4×4, 4WDs, ute, bike, or boat, we can pay top dollar for any of them, no matter what their age/condition. We will immediately tow away your old car to our local junkyard FREE of charge. We’re happy to pay you TOP DOLLAR for all vehicles including Toyota, Ford, Mercedes, BMW, Mazda, Jeep, Landrover or Nissan. Whatever your motor vehicle is, whether it’s in running condition or not, we can purchase it and can quickly remove it for free!!! Contact Us IMMEDIATELY for a completely FREE Quote! Our master car removal experts can reach your place within hours and even on weekends. We will complete the paperwork and pay you the promised cash at your door.